Staples has a great deal on batteries and who doesn’t need batteries. 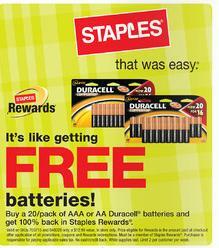 Buy a 20-pack of Duracell batteries and you’ll get a Staples Reward for 100% of the purchase price. This offer expires December 31, 2010.